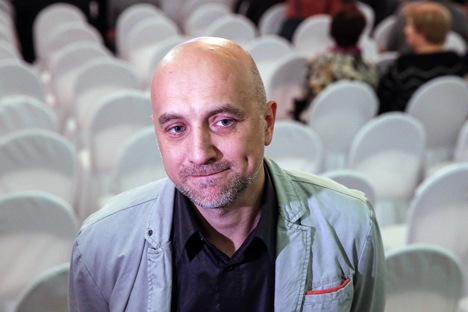 Famous writer Zakhar Prilepin, who lives in a small village 250 miles from Moscow, has come to the capital to accept yet another literary prize. RBTH talked to the author about his books, his reception in the West, and the conflict in Ukraine. Zakhar Prilepin is a member of the National Bolshevik Party, which is banned in Russia, and a former employee of the OMON (the “Special Purpose Mobile Unit,” or more commonly – the riot police) who took part in the Chechnya conflict. He announced his arrival on the Russian literary scene in 2004 with his novel “Pathology” and now has more than 10 books and a plethora of prestigious literary prizes to his name. His latest novel, “The Cloister,” tells the story of the Solovki prison camp and was acclaimed as book of the year in Russia. Just a few days ago, it won the Big Book Prize for the best book of any genre written in Russian. Russia Beyond the Headlines: What is it like to be the author of the book of the year? Zakhar Prilepin: I’m an adult and react calmly to those types of things. There is a new author of the year every year. Literature is a field in which you constantly have to prove your worth until you’ve gained some kind of critical standing. RBTH: What is the secret behind “The Cloister’s” success? Z.P. : I think it’s partly connected with the fact that the book wasn’t read as a history of camps from 100 years ago. It’s a novel about everything that concerns a Russian: relationships between men and women, free will and servitude, the relationship between man and the heavens above him. Sergei Yesenin once said that “the big picture is seen from a distance.” We have moved a short distance and can understand something about our present selves by looking at those times. Also, it’s just a good book. RBTH: You have been translated into many languages, but you are a “very Russian” writer – does that make it hard for foreigners to understand your work? Z.P. : That’s sort of a myth – largely a Russian one – that the world isn’t interested in us and our provincial problems. But there is no such thing as universal literature, besides literature about humanoids that no one has ever seen. Dostoyevsky and Tolstoy are our private sufferings, after all. Maybe that’s why foreigners are a little more enthusiastic about Dostoyevsky than we are – he reveals our essence, and foreigners judge Russians based on Dostoyevsky’s characters. RBTH: Can you give any advice to people who translate your work? Z.P. : Don’t pay attention to everyday Russian particularities – just translate them so they make sense to the reader. It is often more important to capture the spirit rather than create a textual match. There’s a good example from my very first translation into another language – “Pathology,” which was translated into French in 2006. The translated version stated that the OMON fighters in Grozny in 1996 ate “sardines,” whereas the direct translation should have been “anchovies.” They also drove in a “Jeep,” where the Russian version had them in a “Kozelok” [the common nickname for the Russian-made GAZ-69 light truck]. At first it felt strange, but the translator explained that only poor people eat sardines in France, and they don’t have the Kozelok, so I realized she was right. The most important thing is that it makes sense. RBTH: Are there any plans for new translations into English? So far only “Sin” and “Sankya” have been translated. Z.P. : According to my agent, there is very serious interest in “The Cloister” in the United States. RBTH: Are Prilepin the author and Prilepin the public figure two different people? RBTH: Which work of Russian literature would you recommend to foreigners? RBTH: You were greeted with a lot of enthusiasm by the public at a meeting you attended at the Frankfurt Book Fair. What reaction were you expecting? Z.P. : I also went to Prague and Bucharest after Frankfurt, and the reaction was quite enthusiastic everywhere. I don’t try to put on an act in front of foreigners; I say what I consider to be necessary. There is an information vacuum in the West. They don’t read in Russian there and don’t consume any information other than what is shown in the media. In Russia people read in many languages, and it’s easier for us to interpret the situation in the world, despite our television, which is quite propagandist and unfriendly towards the West. Ultimately, I say things that are obvious for us, while Europeans are incredibly surprised by them. When I gave a speech in England, in relation to the events in Ukraine I said that we’ll behave in the way we consider it necessary to behave because we were dragged into the situation, and we have been forced to make certain decisions. The people at the meeting simply stood up and started clapping. RBTH: You have been to the Donetsk region several times recently. Tell me about your views regarding Ukraine. Z.P. : I went to Donbass several times and was surprised to discover how many non-Russian volunteers are going there: Ossetians, Chechens, Georgians. It’s worked out that the fight against corruption in Ukraine has imperceptibly turned into Russophobia. Some people felt that this was a guarantee of a great future. Russia viewed that with some skepticism but tolerated it. Ukrainian society imploded at some point, and we had to take sides. I also used to travel a lot to Ukraine in the past. Even then the Ukrainian intelligentsia was anti-Russian and said that the country was on the brink of civil war. Now Russia is being accused of everything, even though Russia has nothing to do with it. Half of Ukraine has no desire to be part of the Ukrainian mythology and matrix. They want to live with Russian history as their basis and speak Russian. Conditions were created for Russians where they felt they were visitors in Ukraine and needed to act like visitors, even though they had always lived there. Everything reached the point of absurdity. Some kind of Ukrainian history was thought up that nobody knows because it isn’t confirmed by any sources. They thought it up in Ukraine and want Russian people to believe it – but they don’t want to. Foreigners don’t understand that, and they interpret the Russians’ refusal to accept the Ukrainian mythology as aggression. But when the people say they don’t want to live that way, that’s democracy in its purest form. RBTH: What was the goal and mission of your trips to Ukraine? Z.P. : I have a variety of goals there, but the most important one is that I have been a constant supplier of humanitarian aid to a variety of services and people since the very beginning – particularly for civilians, hospitals and schools. RBTH: When and how will this war end? Z.P. : It would finish if the U.S. took a month-long vacation and said they weren’t going to do anything else. Now the question is who will feed and rescue Ukraine, because it doesn’t have a safety net – it’s a bankrupt country, and its 40 million people have been left without sustenance. Europe will either keep accusing Russia of everything under pressure from the U.S. – and all this will continue – or it will feel sorry for those unfortunate people and bail out part of Ukraine, leaving the other part free to move closer to Russia in some or other way. It is completely obvious that Ukraine is incapable of militarily defeating Donbass. Nor can they stop this war, because the situation is incredibly heated. Mobilized Ukrainian society is like a bicycle – as long as the war continues, it will keep going; as soon as it ends, it will start to fall. The question is: Who will pick it up?